Bob Hope's hilarious comedy that pokes fun at detective movies of yesteryear. Ronnie Jackson is your average happy-go-lucky photographer. Naturally, Ronnie doesn't even think twice when he happily volunteers to take care of his neighbor's private-eye office. That is until a beautiful brunette walks into his office begging Ronnie to find her missing husband. Soon Ronnie finds himself on a wild goose chase that leads to murder. Four years after his hit comedy The Paleface, Bob Hope returned to the screen as Junior Potter, son of Painless Peter Potter, the hapless hero of the first film. The Harvard-bred Junior heads out west to claim his father's inheritance. Returning for the sequel, but in a different role, is Jane Russell (The Outlaw) as an outlaw named Mike who continually has to save our hapless hero. Also starring in the sequel is the King of the Cowboys himself, Roy Rogers and his horse Trigger, who portray themselves. Hope teams with the pair to help get to the sequel is the Oscar-winning song "Buttons and Bows." Co-writer and director Frank Tashlin, a former cartoonist and screenwriter of the first Paleface, also worked with Hope on The Private Navy of Sgt O'Farrell and wrote and directed several Jerry Lewis films such as Cinderfella and The Geisha Boy. BCI presents its latest HD DVD double feature (and, in light of the death of the format, apparently its last) with 'My Favorite Brunette/Son of Paleface.' This one pairs a couple of gems from Bob Hope, and for me its a pair that's a hair more entertaining than BCI's last Hope two-for-one, 'The Road to Rio/The Road to Bali.' Neither 'Brunette' nor 'Paleface' are great cinema, but Hope is agile with the one-liners, and the dated plots are quite enjoyable. 'My Favorite Brunette' (1954) is a film rarity -- a noir-spoof. Hope stars as Ronnie Jackson, a baby photographer who dreams of being a private eye (seriously, I'm not making this up). He gets his chance when Baroness Carlotta Montay (Dorothy Lamour) arrives on his door seeking assistance, but of course this a film noir, and every one needs a femme fatale. Soon Ronnie gets mixed up in a complicated, comedic plot of double-crosses and mystery-intrigue. Also popping up are Peter Lorre and Lon Chaney, who may -- or may not -- be killers. 'Son of Paleface' (1952) is a sequel to 'The Paleface,' and again stars Hope as Peter "Junior" Potter. This time he returns to collect on his late father's inheritance, which he thinks is going to be a tidy sum of cash and property. Unfortunately for Junior, dear old pops also left a legacy of bad debt, not to mention the return of Mike "The Torch" (Jane Russell) and her gang of thieves. And on top of that, Roy Rogers joins the show as Federal Agent, who's chasing Torch, bringing along his mischievous horse Trigger to steal the show. The plots of 'Brunette' and 'Paleface' are beside the point. The former, in particular, falls quite flat on its own, unless you are a true noir connoisseur -- it's certainly only there to hang Hope's jokes off of, but despite the dated aspects of both films, Hope reminds us why he was such a star. Even such vanilla, play-it-safe comedy has real zest in his hands, and some of his mimicry is hilarious (in particular his impersonation of Rogers). I was also impressed with the physicality of the stunts and various chase scenes in both pictures, which are quite well done and in some ways even trump today's CGI-assisted action flicks, as at least here we know all of the actors/stunt people are really doing these crazy gags. Marring 'Paleface' in particular, however, is a unseemly underbelly of racism, with the caricatures so blatant that it leaves a bitter aftertaste in the mouth. I was still able to enjoy both features enough that I could ignore the insulting humor and a couple of jaw-droppingly awful songs in light of the ignorance of the time, but I suspect many of you might be less accommodating. There is still enough good-natured tomfoolery on display here to make this set worth watching (it's certainly a must-see for Hope fans), even if neither 'Son of Paleface' or 'My Favorite Brunette' are true comedy classics. Put this one in your Netflix queue, and mark as a "rainy day nostalgia" rental. 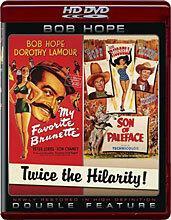 BCI presents both 'My Favorite Brunette' and 'Son of Paleface' on a single HD-30 dual-layer disc. Each film has an aspect ratio of 1.33:1 (pillarboxed in a 16:9 frame for HD) and is encoded in 1080i/MPEG-2, with 'Brunette' in black & white and 'Paleface' in glorious Technicolor (ironic, considering its title). The source on 'Brunette' is fine if a bit spotty. There is the expected grain (which is only occasionally distracting), but dirt and speckles can be frequent. Blacks look a bit bright at times, and contrast certainly could have used some improvement. The image is also soft. However, as 'Brunette' was produced in 1947 and long ago fell into the public domain, it's hard to be too critical. Detail is still better than I would have expected, and there were a few isolated moments when the image had enough visible depth and texture that I was superior to any cable broadcast or DVD presentation I've seen of similar vintage material. No, this is no Warner-level remaster, but it's certainly watchable. BCI/Eclipse offers only Dolby Digital 1.0 Mono (192kbps) audio on both 'My Favorite Brunette' and 'Son of Paleface.' Don't expect much, here. Typical of most of BCI's double-feature discs, there are no extras here. Even the menus are just a rehash of the static navigation found on the standard DVD versions. 'My Favorite Brunette' and 'Son of Paleface' are both amusing little comedies, notable more for the presence of Bob Hope (and a few good tunes) than anything else. This BCI double-feature disc is perfectly fine, with pleasant video and audio but nary a single extra. However, you do get two fun vintage flicks for the price of one, and you certainly can't beat the cheap $19.98 MSRP.